The May issue of Romantic Homes magazine is on the stands and inside you will find a nice little feature on the courtyard wedding we had last September. 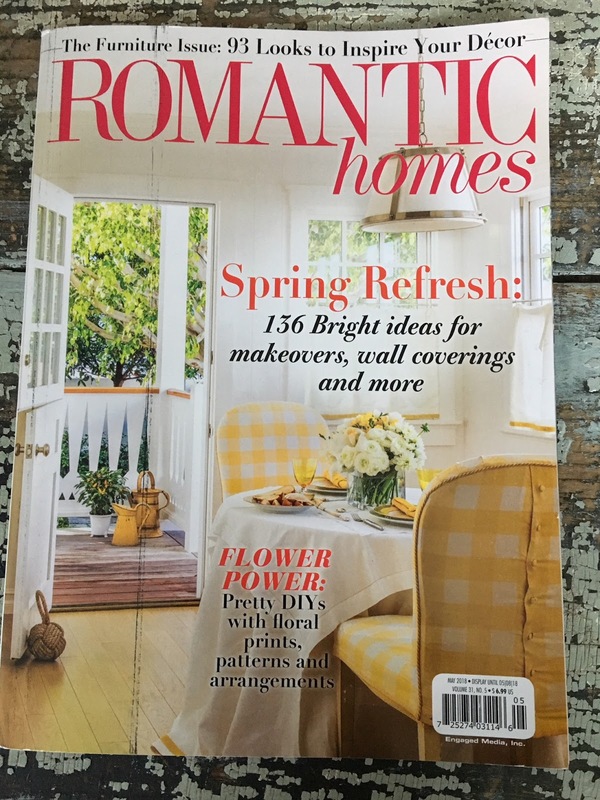 The cheery yellow and white cover is hard to miss, so look for it in Barnes and Noble, grocery stores, Walmart and other places like that. as well our wedding feature. 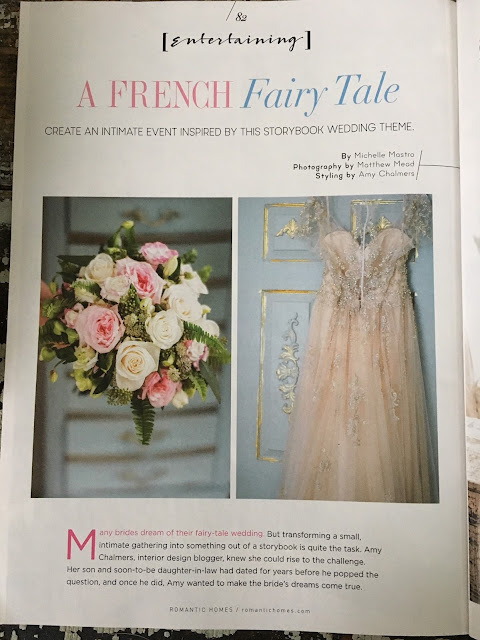 Here is a sneak peek, and it tells the story of how I conjured up the fairy tale theme with a French twist to guide the decorating angle of the wedding. All the advice is applicable to throwing a party as well, so I hope you enjoy the narrative as well as the beautiful photos taken by Matthew Mead. Our wedding had guests arriving inside the home, and then ushered to the outdoor area where a tent stood waiting for the festivities, so both images inside and outside are part of the spread. and I am honored to be included. As with any magazine feature, a lot of cuts must be made, yet some of my favorite images and elements were not shown. If you have read the article and would like to see more, this is for you! 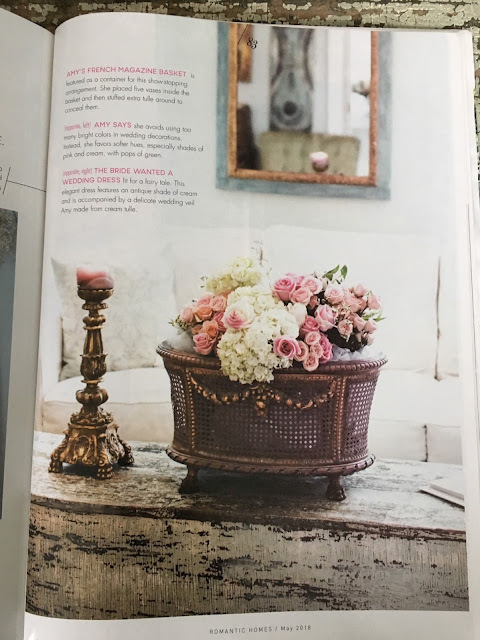 It was hard to tell the relationship of each space to each other from the published photos, most likely due to our spaces being small and rather nook and crannyish. 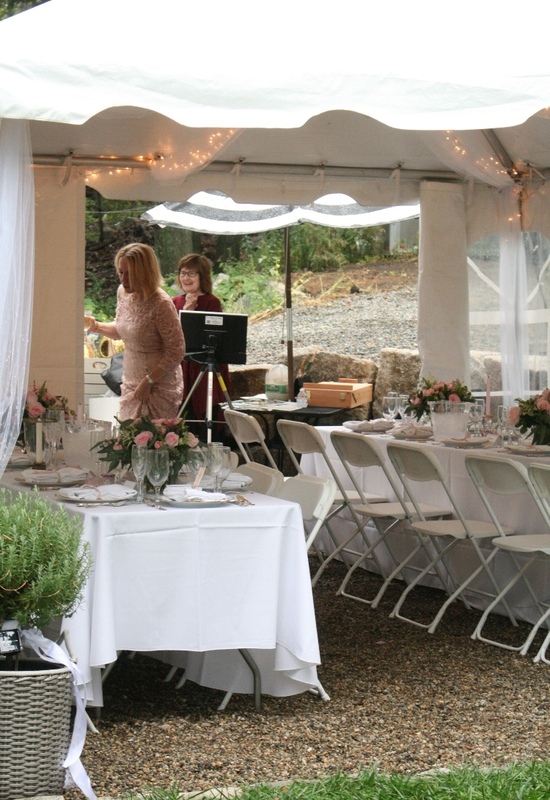 Here the tent looks up to the arbor where the wedding vows were performed. 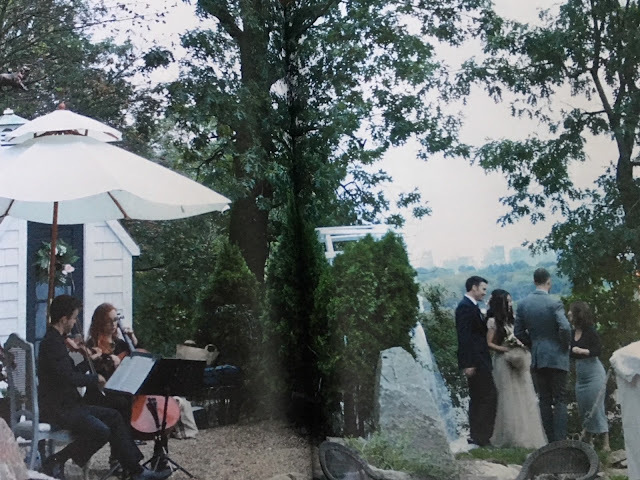 We used all the little garden spaces for different purposes, as you can see on the upper level where the bride and groom are chatting in front of the arbor, where they had exchanged wedding vows, with the Boston skyline in the background, while the musicians played in front of the garden shed. The tent sat just below, beside the house in our small pea gravel courtyard. My favorite element in the wedding that didn't get mentioned was the live event artist. Sheila Foley is one of the best in the business, and happens to live in the greater Boston area. 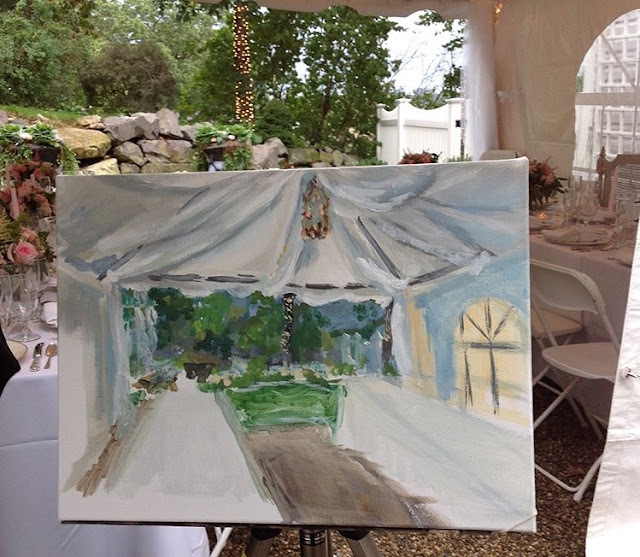 She came early and painted the background scene on her canvas, which was the interior of the tent leading to the cabbage garden and arbor where the vows were exchanged. I love how she included the chandelier and tulle draped from the ceiling of the tent. As the wedding progressed, Sheila added guests and the wedding couple into the painting, while we all ate, drank and made merry. Before the festivities I came out to see if everything was ready to go... Sheila is at her station with her art supplies and easel. 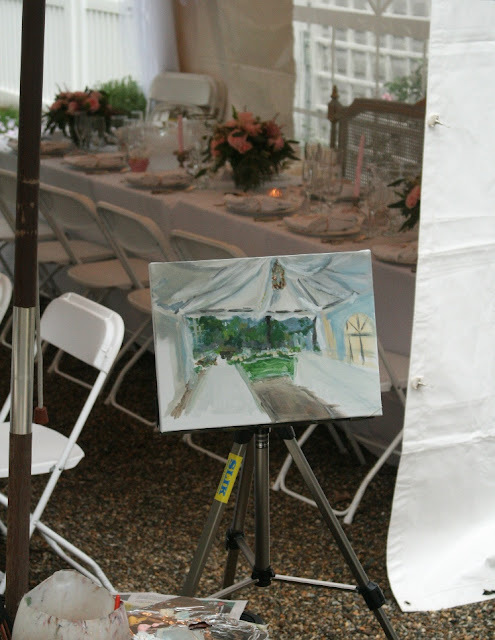 Because it had rained, we needed to set up a table umbrella to protect both artist and artwork! You can see the white picket fence beyond where the bride would emerge to climb the old stone steps to the grassy terrace to say her vows. Sheila had the background ready for adding all the details, including champagne bottles, the french settee, floral arrangements and of course all the people! This is a sneak peek collage of the painting progression so far! I can't wait to reveal the entire painting and already imagine it in a fancy French gilded frame, hanging on our walls, reminding us all of that special day. 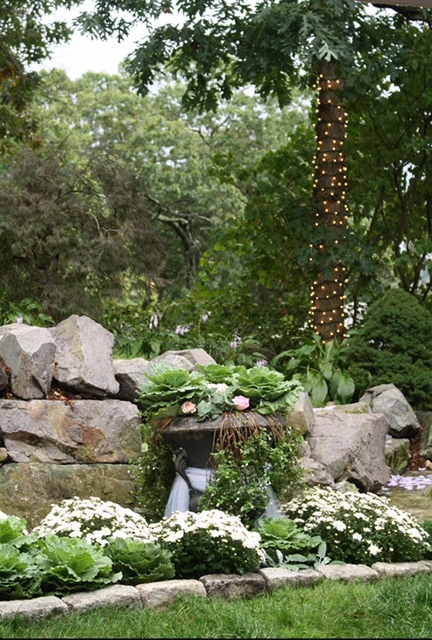 White Belgian mums and ornamental green and white cabbages planted in a formal layout. were tucked in between the large cabbage leaves. Simple. Elegant. And very French. in the Louis XVI style. They are truly marvelous little chairs, all hand carved with gold leaf. Destined for my bathroom for now. I adore old and French, and these fit the bill. Congratulations on the magazine feature! 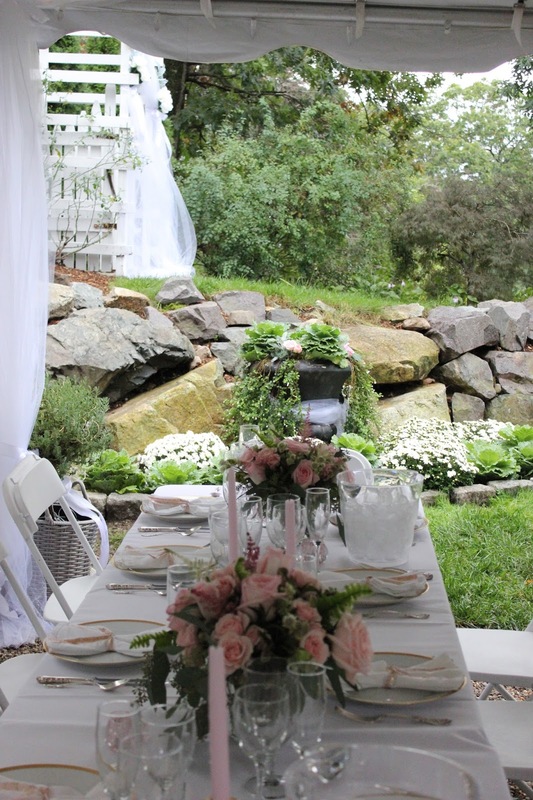 You did such a wonderful job making their wedding a dreamy affair. Well done! Can't wait to see the full reveal of the wedding painting, I know it is going to be a stunner. Perfect romantic reminder of the day. Amy, you are so talented! From decorating , painting, organizing , the list goes on. And the live event painting boggles my Mind! How beautiful. I wanted to tell you how impressed I am with your paintings. And the fact you do it with ASAP! Have you ever taken art lessons , or did you just dive in? Congratulations on the magazine spread. Your courtyard is spectacular. Chocolate Box Cottages....No silly, you don't eat them!